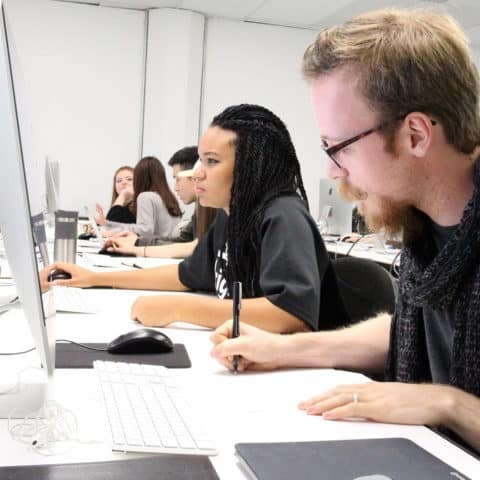 The Academy’s graphic design studio facilities are designed to prepare you for a career as a professional graphic designer. Our hands-on learning environment creates a culture that supports curiosity, investigation, and production. Online students are also hands-on, as they engage in discussions and activities through the online platform, social media, and real-time streaming of our events. Both online and onsite learning environments are equipped to give you the skills you need to create the design career of your dreams. Our MacLab offers the latest digital workstations, software, and new media technology. Professionally mount your work in our custom spray mount room. With two spray mount booths, light table, and paper cutter, learn to present your work professionally using best practices. Experience a real design agency with our industry-standard tools and classrooms with full production environments and client pitch rooms. Drawing workshops are held throughout the semester, giving students access to live models.